Over time, strains brought to the islands from across the oceans adapted and acclimated to Hawaii’s unique environment and were passed down from generation to generation. These exotic varieties, such as Kona Gold, Puna Budder and, of course, the legendary Maui Wowie, inspired generations of surfers and hippies looking for the signature “electric” buzz. Old-timers still rave about the uplifting aspects of these sativa-dominant strains, eagerly reminiscing about their mildly hallucinogenic high with no “ceiling”—a toker could keep puffing and puffing and yet still reach new heights of blissful euphoria. Recent research has found that these varieties are especially rich in THCV, dubbed the “sports car of cannabinoids” by Steep Hill Labs, due to the quick onset and relatively short duration of psychoactive effects. Strains with higher levels of THC come on quite strong and can induce panic and anxiety in some users if they aren’t careful. Some patients also report that THCV works as an appetite suppressant, which, if true, imparts this compound with tremendous potential from a pharmaceutical perspective. Hawaii’s marijuana history, however, took a turn for the worse in the 1980s with Operation Green Harvest, a decades-long campaign that saw federal, state and local law-enforcement agencies using assault helicopters, masked officers with AK-47s and more in an attempt to eradicate domestic cannabis cultivation and lock up farmers. 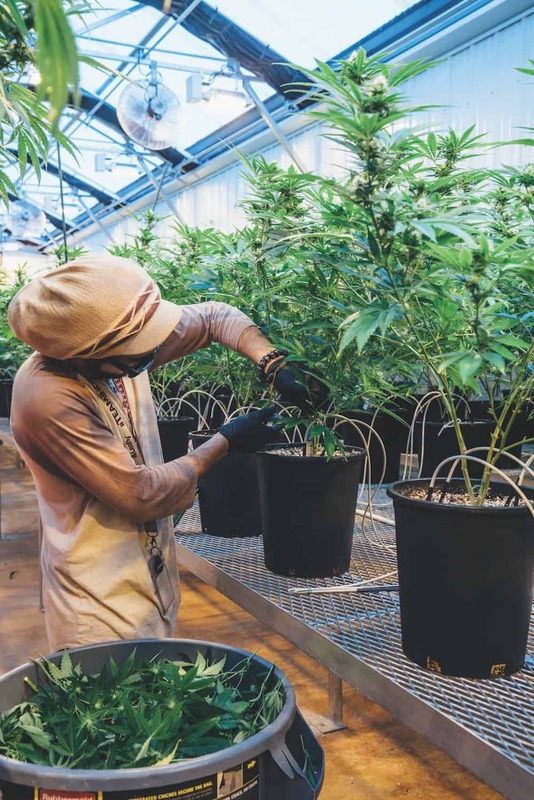 This aggressive effort devastated the islands’ cultivation community as well as pot consumers, and many say the misguided fiasco helped lead to an epidemic of hard-drug use and a methamphetamine crisis that continues to this day. The dark days for Hawaiian dankness would continue for years until the voters finally decided to make a change. Although Hawaii legalized medical marijuana for qualified patients and caregivers in 2000, it wasn’t until almost 20 years later, in 2016, that the state finalized the rules governing its dispensary program. These new regulations require eight state-licensed dispensaries to grow, manufacture and sell their own products to eligible patients with a valid state registration card. The one I’m visiting, Aloha Green Apothecary, opened in 2016 with a traditional Hawaiian blessing ceremony in downtown Honolulu on the beautiful island of Oahu. Everything it sells must be lab-tested for cannabinoid profile, pesticides, mycotoxins, heavy metals, moisture content, microbial impurities and solvents (when applicable). 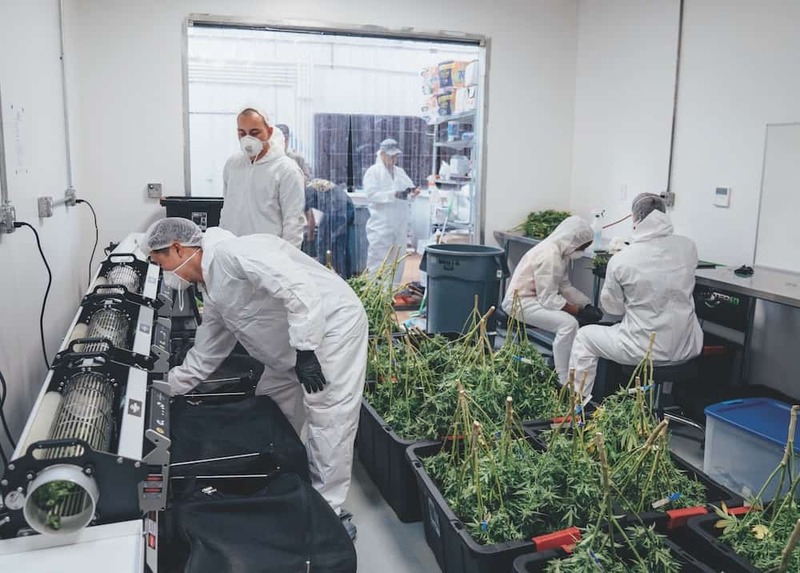 The strict guidelines also require an FBI background check for all employees or visitors, which means that for the first time in my cannabis-cultivation reporting career, I have to apply for permission from the government to visit a legal grow. As Aloha Green’s director, Helen Cho, assists me through the process, I joke about how the times have changed: When I first started covering clandestine indoor pot farms for High Times almost 20 years ago, I sometimes had to ride in the trunk of a car or wear a blindfold. Now I was politely asking the feds to allow me to pay a visit to a licensed facility! Aloha Green Apothecary produces its flowers and extracts on the island of Oahu on land that was formerly part of the massive Dole Plantation. I drove out to meet this dedicated team of locals to find out more about their commitment to creating quality medicine using locally sourced materials. Upon approach, the tropical landscape gave way to a well-protected seven-acre plot surrounded by ample security fencing and cameras. The rich, dark-red volcanic soil and bright sunshine reveal this as a place where agriculture has thrived for ages and will continue to do so. My tour begins with Aloha Green’s head grower, Daniel Richardson, excitedly explaining his philosophy for growing artisanal cannabis for the community of patients in Hawaii. The goal is to tread lightly, making use of as much local material as possible while taking advantage of the natural environment by using greenhouses to grow some of Aloha Green’s flowers. By reusing whatever they can, the Aloha team strives to treat the community and their patients with the respect they deserve. 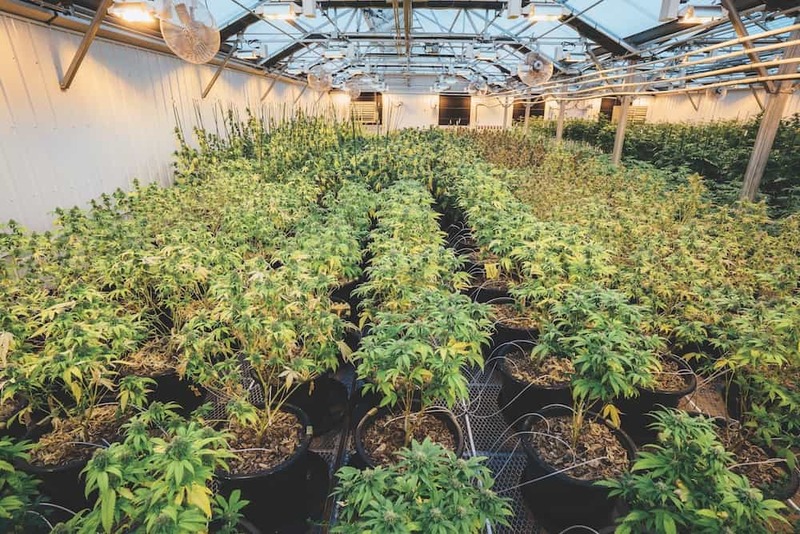 In fact, Aloha Green is the first state licensee to use several greenhouses to grow its flowers, which has cut the cost of production by a third—all the more important as Hawaii has the most expensive electricity in the United States. The company also has plans to convert to solar for much of its power usage in the future as well. Aloha’s growers are even experimenting with cover crops such as clover to provide nitrogen while also acting as a mulch to conserve water potentially lost to evaporation. Wood chips on top of the growing medium acts as insulation from water loss as well. Mother plants at Aloha Green are nurtured under fluorescent and HID (high-intensity discharge) lighting and hand-fed with a nutrient solution to keep them thriving. Mother-plant vegging rooms are climate-controlled with fans, ensuring that air is circulating and not stagnant. The moms are grown in large containers so that their roots can find plenty of space and expand. This ensures that the plant up top stays healthy and continues to create new growing shoots from which to take and root clones. Clones root in plugs in meticulously labeled plastic trays with clear lids under fluorescent lighting tubes to maintain heat and humidity for ultimate rooting success. They’re cut from healthy mother plants, dipped into rooting-hormone gel and then gently secured into their individual rooting cubes. The larger fan leaves are then trimmed down to alleviate the pressure on the cutting to maintain life. Once they’re showing healthy white roots from the bottom of their plugs, they’re ready to plant into larger pots filled with premixed growing medium and move into the vegetative stage of growth. Lower branches and leaf growth are removed to increase airflow beneath the canopy to avoid possible humidity buildup. In all, there are four indoor flowering rooms and four greenhouse sections at Aloha Green for a total of eight separate growing chambers. The indoor plants are grown under Gavita double-ended HPS (high-pressure sodium) 1,000-watt lights on a staggered flowering schedule and harvested every two weeks. Plants in the greenhouses are supplemented with lighting as well when sunlight isn’t sufficient. For the growing medium, the team at Aloha Green make their own “supersoil” mix. It’s a combination of rich local soil plus compost from a nearby school. Because of the many microclimates on Oahu, the soil Aloha Green uses is unique and diverse with 10 of 12 soil varieties on the island represented. Volcanic pumice is added instead of perlite to loosen up the soil. This airy loam is then amended with local Hawaiian chicken manure, worm castings, fish waste, and seaweed. The company has even experimented with turning macadamia-nut shells into biochar. Aloha Green’s goal is to use no added nutrients, and it utilizes drip emitters to provide mostly plain water directly to the root zone. Local mulch from the wood of the monkeypod tree keeps the soil surface cool and reduces water waste from evaporation. Ideally, Aloha Green will reuse its soil over and over in a closed-loop system that improves the growing medium with each growing cycle. Each plant is tagged from seed to harvest with its strain name and germination date, and wooden stakes are used to hold up branches that become weighed down with heavy flowers. The water itself comes from a 1,000-foot-deep well tapped on the premises. The water is filtered naturally through lava rock and comes out with very low levels of any minerals or contaminants. Multiple drippers in each growing container also provide redundancy in case of a clogged tube or emitter. Wet walls and swamp coolers reduce heat in the greenhouses on really hot days and desiccant-based dehumidifiers remove moisture in the air when necessary. Plants sit on trays that allow airflow underneath the canopy to reduce the probability of mold or mildew collecting in moist air pockets. Excess water and nutrient solution easily drain out of the bottom of the containers to prevent the pots from sitting in stagnant liquid. Aloha Green growers use beans as indicator, or trap, plants, and rosemary and other deterrent plants to repel insects as well. Workers and visitors alike wear full-body protective suits including booties and hoods to avoid any potential contamination, and yellow sticky pest strips are everywhere in order to get an early warning as to any potential pest invasions. A strict integrated pest-management system ensures that the flowers and concentrates produced here are clean and pass their tests with flying colors. As the plants at Aloha Green approach maturity, they’re aggressively flushed with plain pH-balanced water. 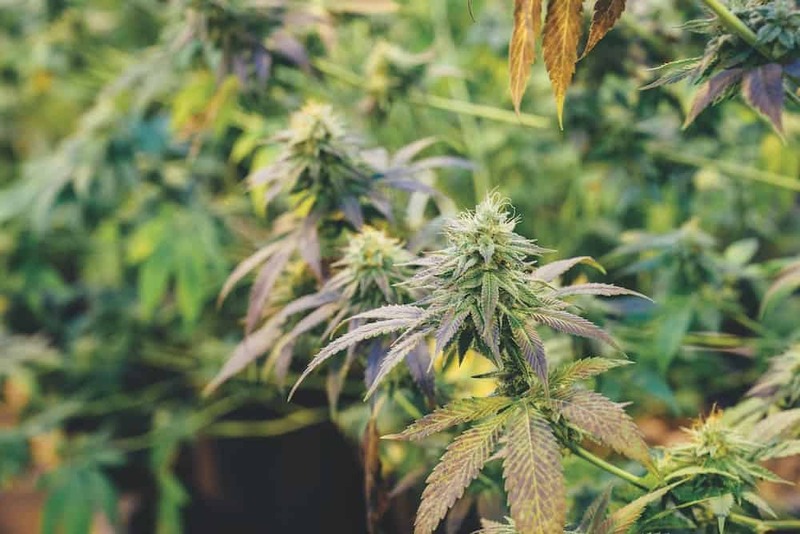 Head grower Daniel Richardson emphasizes the importance of a proper flush in order to produce flowers that can be considered proper medicine for patients. He insists that whether Aloha Green’s end product is used for flowers, concentrates, edibles or tinctures, it’s clean and free of excess chlorophyll and nutrient-salt buildup. As I walk around the growing chamber next to be harvested, I can see the fall colors of the fan leaves on display. These fading hues are a sure sign of a successful flush, and the end result will be buds that burn cleanly to a wispy white ash—perfect for connoisseurs and patients alike. The properly flushed plants are now in the final stretch, during which their trichome gland heads will swell with essential oils in preparation for harvest. When the time to take down a roomful of vegetation has been determined, the plants are pre-trimmed while still alive. Large fan leaves are removed by hand from each plant in preparation for the drying process. Then branches are individually hung to dry in rooms environmentally controlled by Argus climate systems. Sensors maintain specific temperature and humidity while UV light kills off any potential pests or mold spores, and Airocide filters purify the air. 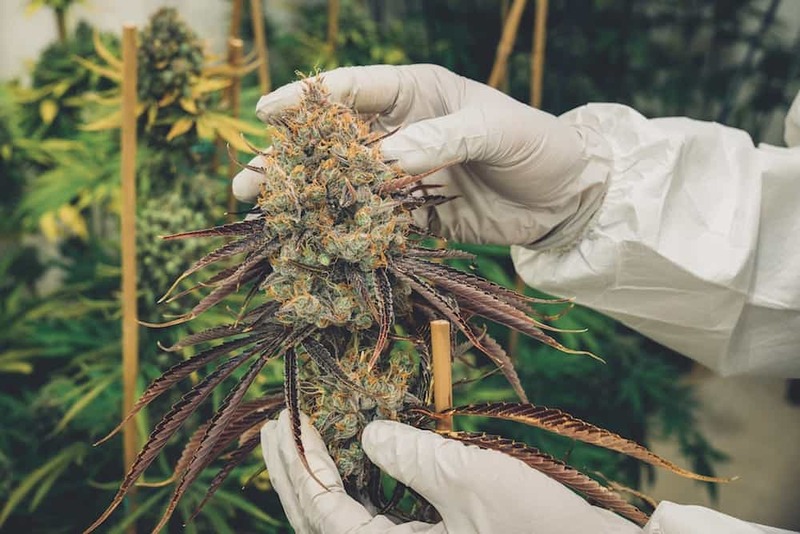 The indoor harvests are all hand-trimmed dry prior to curing, while the yield from the greenhouses is machine-trimmed using industrial Twister units and then dried on individual racks. Trim and leaf leftovers are set aside for ethanol extraction to make RSO (Rick Simpson Oil) for oral ingestion. The company also produces oil, shatter, rosin wax, balms and tinctures, so there’s something for every patient on the shelves of Aloha Green Apothecary. The post Aloha Green Apothecary is Growing Stunning Legal Medical Bud in Hawaii appeared first on High Times.